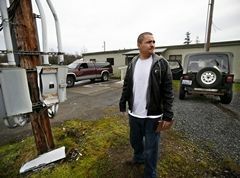 Rico Jones-Fernandez waits in a gravel lot outside a vacant building on the Tulalip Reservation on Tuesday for anyone wishing to exchange needles. TULALIP — Since his mother’s death four years ago from a drug overdose, Rico Jones- Fernandez has worked to save other lives that might be lost. His focus has been on people living with addiction on the Tulalip Indian Reservation. “I have the ability to do something, so it is my responsibility to do something,” he said. Jones, a member of the Tulalip Tribes, has been an advocate for expanding outreach programs on the reservation, particularly efforts that reach people who are not yet ready for rehabilitation. Last year, Jones worked to develop a law that shields addicts from arrest and prosecution of misdemeanor offenses when they are seeking medical assistance to save a life. In recent months, Jones also has played a key role in bringing a syringe exchange to the Tulalip community, the first program of its kind for the reservation. In 2010, Jones’ mother, Lois Luella Jones, died of a drug overdose. Her friends did nothing to help her, fearing they themselves would be arrested. His mother’s story inspired Jones to draft a 911 Good Samaritan law for the Tulalip Tribes in hopes that others might be saved. In June, the Tulalip Tribal Council passed the Lois Luella Jones Law, which provides temporary immunity from prosecution for low-level offenses if the person is attempting to get medical attention for themselves or somebody else in any emergency. A higher value is placed on saving lives than filing misdemeanor drug charges, Jones said. Jones began volunteering with the Snohomish County Syringe Exchange in 2014 to learn how he might start a similar program on the reservation. The exchange offered to expand their service and two months ago began exchanging needles at Tulalip every Tuesday. The goal is not to enable drug use, but to prevent the spread of disease. “Hepatitis-C and HIV get on everything, not just syringes. We exchange everything. The cooker, the cottons and the tourniquets,” Jones said. Some criticize syringe exchanges, concerned these types of programs are giving needles away, fueling a problem. His mother’s death continues to drive him, but it is the promise of the future that fuels Jones’ perseverance. Currently, Jones is seeking approval from the tribal council to increase access to Naloxone on the reservation. If approved, people would be trained to administer Narcan, a compound that counters the effects of a drug overdose. Jones, who has never been an addict, hopes to spare others the sorrow of loss he knows too well. “It’s not about drugs or enabling people; it’s about people’s lives. All I do is in hopes of saving lives,” he said. In 2013, 580 people died in Washington from opioid drug overdoses, 86 of whom were from Snohomish County, and Providence Regional Medical Center Everett reportedly treated 440 cases of opiate poisonings. This entry was posted in Health, Local News and tagged drug overdose, Lois Luella Jones Law, Syringe Exchange, Tulalip, Tulalip Tribes by Kim Kalliber. Bookmark the permalink.